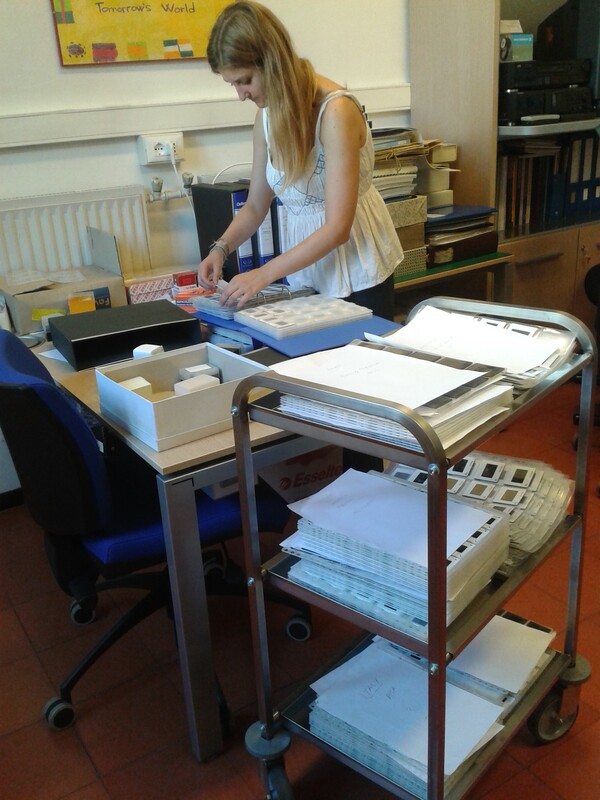 Editor’s Note: MSc Year 2 students often write blog posts for the museums where they currently intern. This example was originally posted to the Science Museum blog, found here. Reposted with permission. 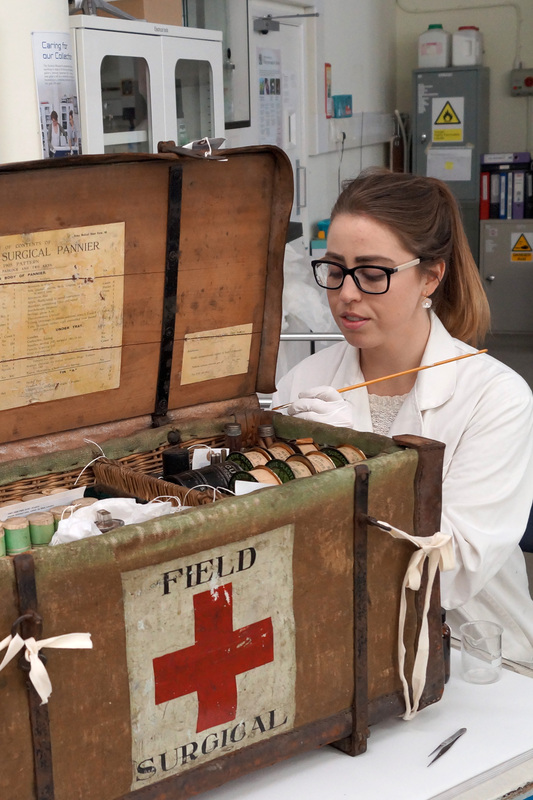 As a member of the conservation team that has cleaned, documented and repaired items for the Wounded: Conflict, Casualties and Care exhibition, I’ve become acquainted with a range of fascinating objects used during the First World War. Among those I readied for display, my favourite is the field surgical pannier set, which was made in Britain in 1905 and would have been used in field hospitals near the front line. I particularly like the pannier set because of the many remarkable smaller objects – over 100 – inside the case. They include instruments used to open up the body and stitch wounds, as well as mundane items such as bandages and plasters. There’s also a saline infusion apparatus that was used to wash wounds, dilute drugs and provide a substitute for blood plasma. 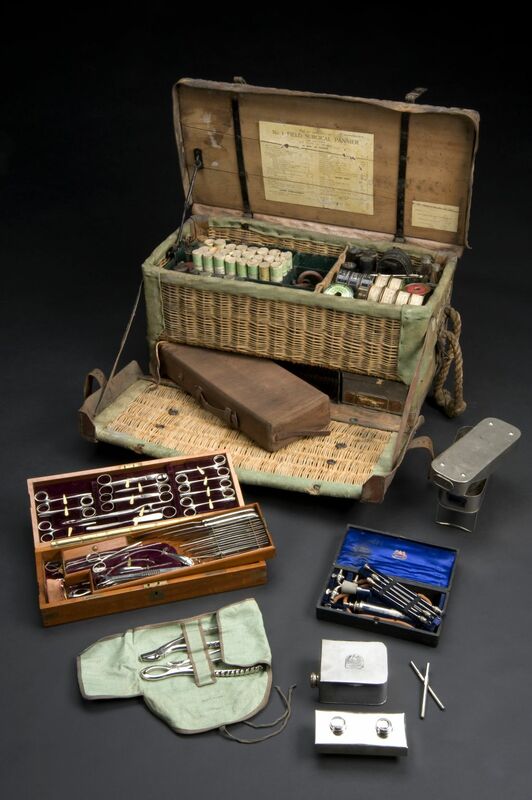 A field surgical pannier set, made in Britain in 1905. Credit: Science Museum. The interior of the pannier and the items inside were treated extensively last year by Louise Stewart Beck, who worked on almost all the objects going on display. However, the exterior – specifically the pannier’s leather components – also needed conservation. And that’s where I came in. My task involved documenting the pannier’s condition, cleaning it, repairing certain areas where the leather was lifting and tearing, and stabilising spots on the surface that were crumbling. Parts of the leather were suffering from ‘red rot’, a form of degradation – not actually rot, despite the name – that occurs in vegetable tanned leathers from the late 1800s and early 1900s. It usually appears as a reddish colour and a crumbling surface, and results from high temperatures and high humidity. To fix the problem I used a ‘consolidant’ to treat the surface locally, which helped to stop the crumbling and stabilise the pannier for the future. Because of its age and how it was used, other areas of the leather – mostly the bottom edges and corners – had split and were lifting from the wicker interior. The location of the damage and the reduced flexibility of the material made this one of the trickier parts of the job. 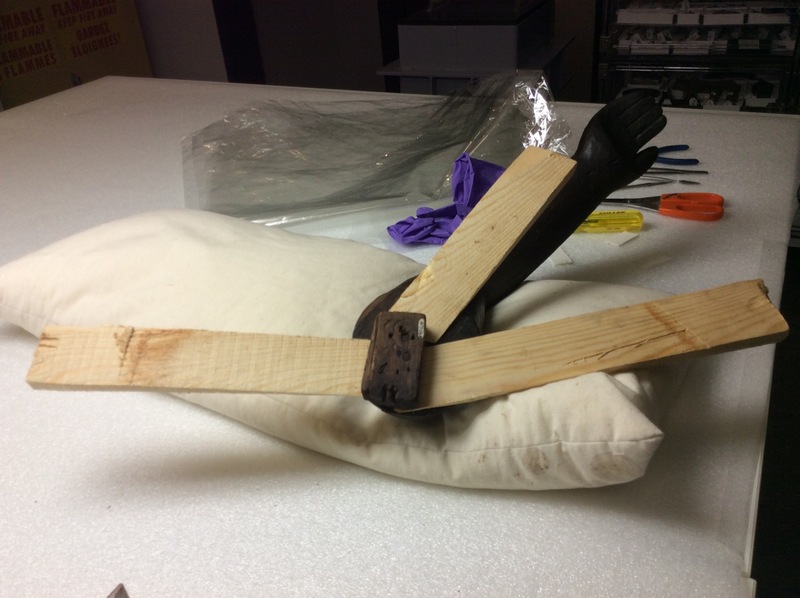 In some cases the treatment was as straightforward as sticking down the leather with an adhesive, but for other sections that were fragile and unable to bend I had to resort to humidification. Where the leather needed extra support to reattach to the wicker, I used Japanese tissue paper colour matched to the brown leather as a kind of patch. Treating the surgical pannier set was both interesting and informative. I look forward to seeing it on display in the exhibition, and I’m sure others will enjoy learning from it just as I have. The conservation program at UCL consists of two Master’s degrees over the course of three years. Two summers of those three years are consumed, more or less, with the writing of dissertations. The middle summer, however, is free. I’m Canadian, and although I’m very happy with my decision to study conservation abroad, I hope to work in Canada when I’m finished. Therefore, I used my free summer to build contacts in Canada by applying for an internship at one of my favourite Canadian museums. 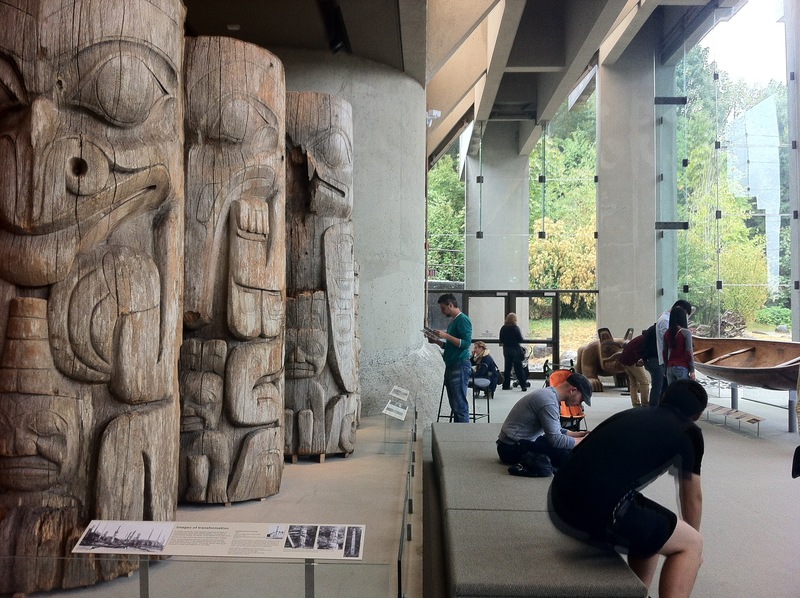 The Museum of Anthropology (MOA) at the University of British Columbia in Vancouver, Canada, has an impressive collection of objects from all around the world, and is most well known for its collection of objects from First Nations groups of the Pacific Northwest. The museum is also known for having a very inclusive policy of working with the communities it represents. Haida house totem pole in the Great Hall, from c. 1870. These poles were originally from one pole, which stood outside the front wall of a house called ‘Plenty of Tliman Hides in This House’, a structure belonging to the family of the clan of ‘Those Born at Gadasgo Creek’, of the Raven moiety. Please read more about them on MOA’s online catalogue, here. I had visited the museum before and was impressed with the collection, the quality of the facilities (there was a major renovation in 2010), and was intrigued by its use of a glass door separating the conservation lab from the galleries. It didn’t hurt that this is the view outside. 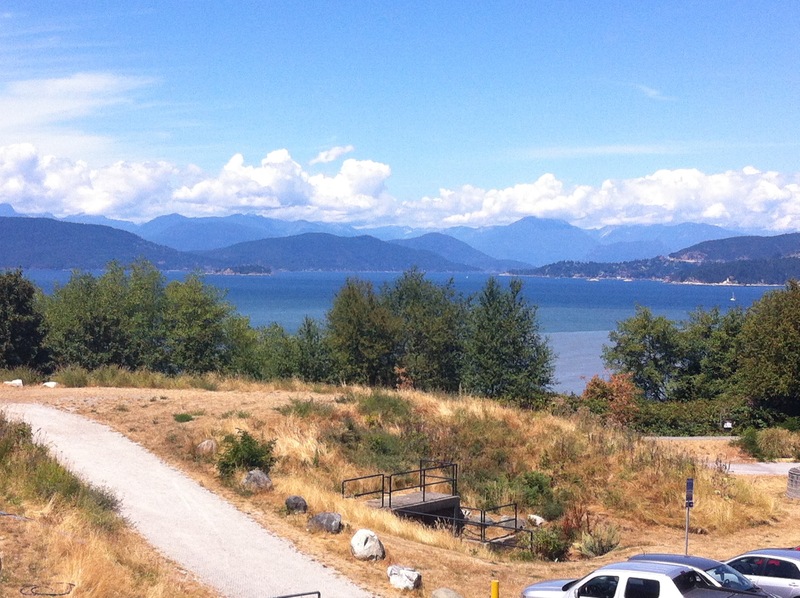 The view from the staff lunch area is not too shabby. At MOA, I worked under the guidance of the conservators Heidi Swierenga and Mauray Toutloff. I completed complex treatments, worked with volunteers, and learned about and assisted with earthquake-proofing of the storage areas (this is not a problem you come across in London!). 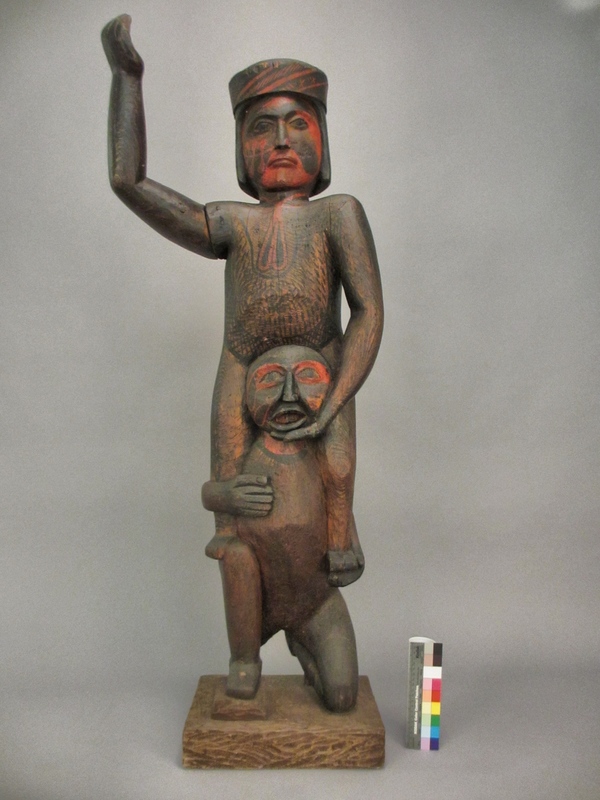 The most interesting treatment I worked on was of a Kwakwaka’wakw wooden figure. 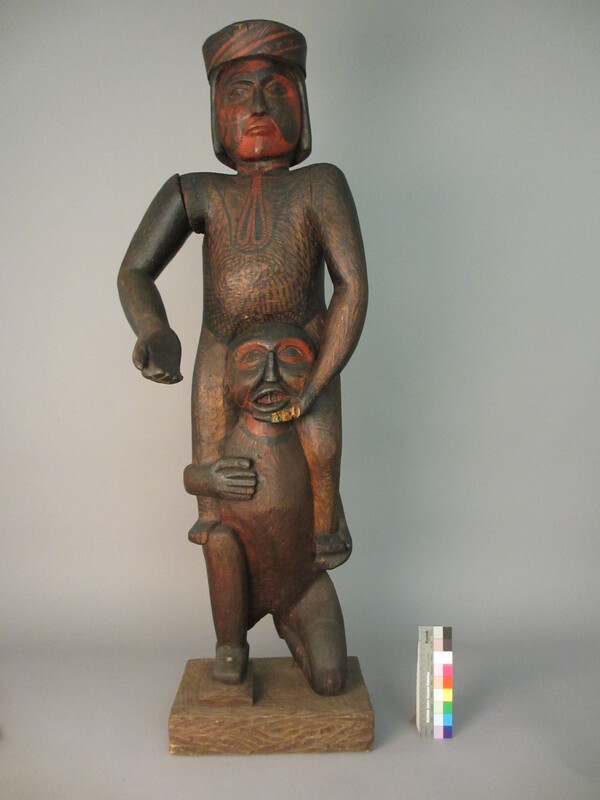 The figure would have been displayed publicly to honour the greatness of a chief, and depicts a chief being carried on the shoulders of a slave. You can read more about the context of the object here. The figures are painted with red and black paint, and the wood – likely cedar – has been stained or varnished. 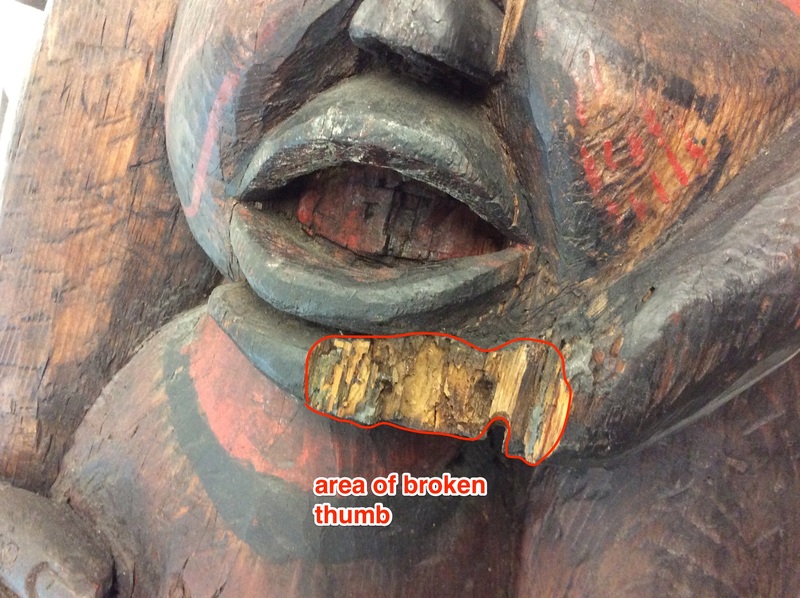 The figure needed conservation as, during handling, the thumb of the chief had fallen off due to a failed previous conservation treatment. At the same time, a curator had come across a historic image of the figure where the outstretched arm of the chief was held in a different position. The historic position was more in keeping with the original context of the object, so we were asked if we could return it to this previous position. The first step of the treatment was to determine how the outstretched arm was connected to the body, and how to remove it without causing any damage. There appeared to be a lot of pieces of wood nailed together around the joint, as well as a bright, new wooden wedge and two different kinds of adhesive. 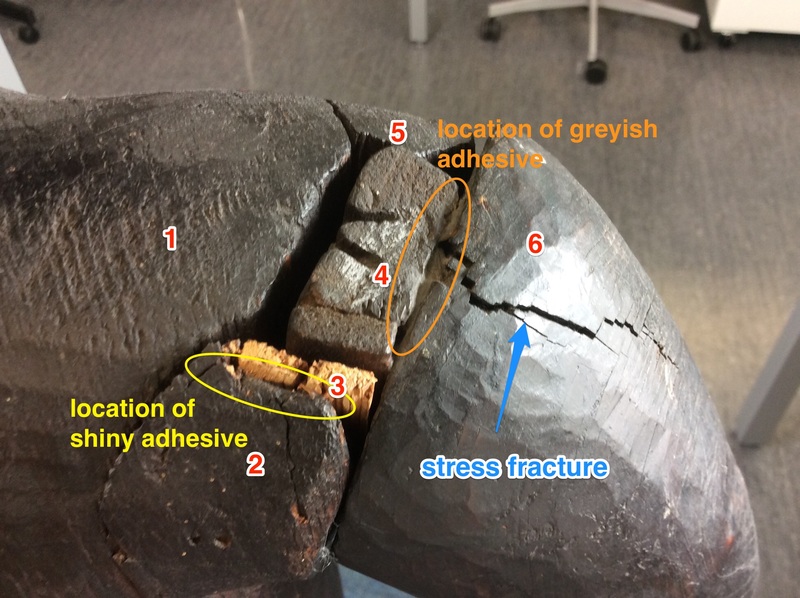 After plenty of examination, it was clear that the arm itself was not nailed in place, but only adhered. 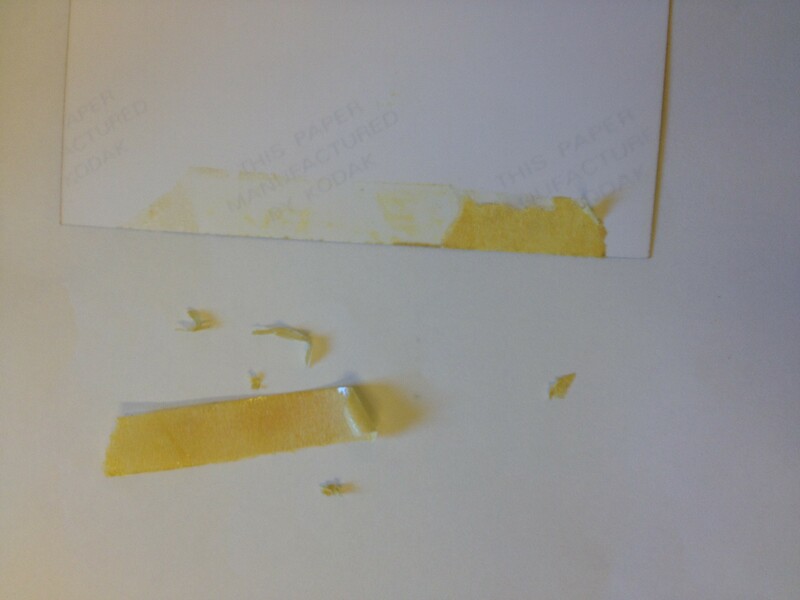 The adhesive was found to be soluble in ethanol, so it was softened with the solvent and the arm easily pulled out of the socket. Stage one of the treatment accomplished! 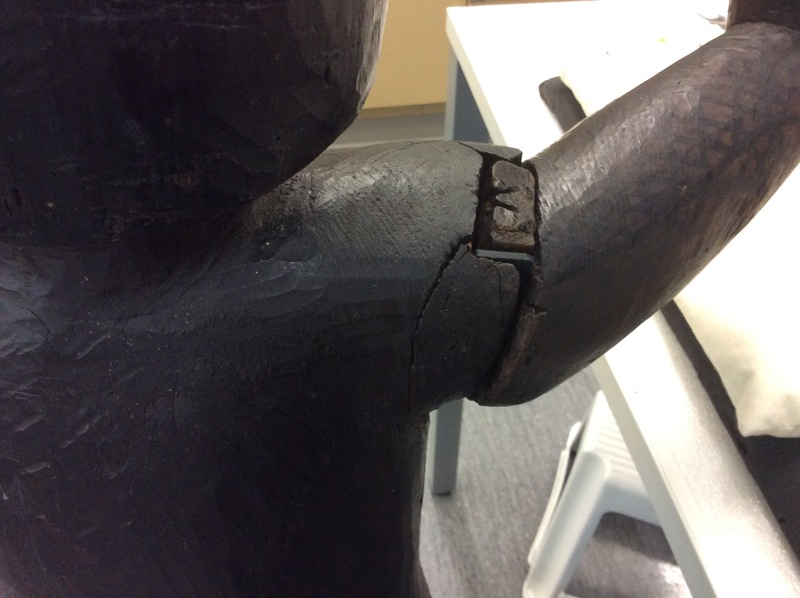 The next stage of treatment was to remove the tenon, of the open mortise and tenon joint, and reattach it at an angle that would put the arm in its historic position. The tenon was attached to the arm with an overly strong adhesive that was causing the wood on the arm to fracture, as well as with six nails. I removed the adhesive with solvent and had to pry the tenon away from the arm using wooden wedges and hammer. Then I removed the nails from the tenon by hammering them out backwards, with a piece of wood to cushion the blows so as to preserve the nails. The slow process of driving wooden wedges between the arm and the tenon to separate them without causing further damage. Both the arm and the tenon were pockmarked with holes from nails hammered in and removed over time. In order to lower my impact on the object, I chose to reuse two of these holes to attach the tenon to the arm in the new position, and used screws instead of nails, which are easier to remove. Finally, I removed the visually obtrusive wooden wedge and replaced it with a piece of 8-ply black acid-free matboard. No adhesive was needed to secure the arm in place. The last step of treatment was reattaching the thumb. Upon examination, four different eras of previous conservation were detected (all prior to the object’s acquisition by the museum in 1973, and the establishment of the conservation labs at MOA). There were wooden wedges, nails, what appeared to be a type of animal glue, and then what appeared to be a more modern synthetic glue. All of these treatments had failed because the thumb lacked good contact with the body. Therefore, I decided to use a combination of fill and adhesive to reattach the thumb to the body, with a modern, easily reversible conservation adhesive. 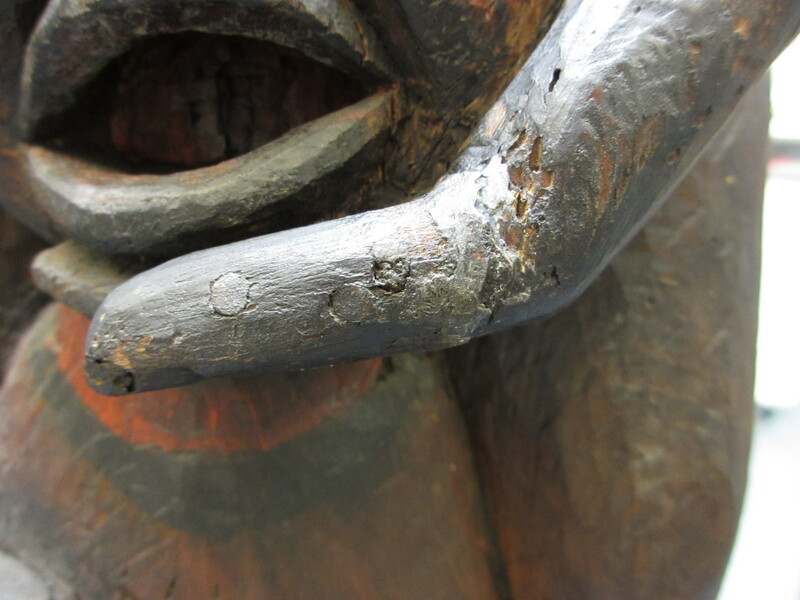 The thumb, reattached more securely to the figure. After the treatment, the object was returned to its location on display in the Great Hall of the museum, with what I see as a much grander and more imposing appearance. My internship experience at the Museum of Anthropology was highly educational and equally fun. 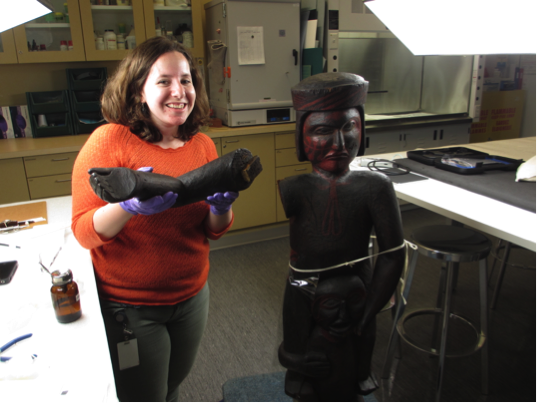 To learn more about conservation at MOA or their conservation internship program, please find more information at http://moa.ubc.ca/conservation/. A week after the end of MSc1, I moved to Rome for the summer to start a nine-week internship programme at the International Centre for the Study of the Preservation and Restoration of Cultural Property (ICCROM). ICCROM is an intergovernmental organization that promotes the conservation of both movable and immovable heritage through training, research and cooperation. My role at ICCROM was within the department of Knowledge and Communication, in the photographic archive. The ICCROM archive contains videos, audiotapes, photographic and paper records that date from the creation of ICCROM in 1959 to the present. I was invited to undertake several rehousing projects and assess the condition of a portion of the archive’s photographic collections. I started my internship by rehousing H.J. Plenderleith’s glass slide collection, placing each slide in individual acid-free paper envelopes. 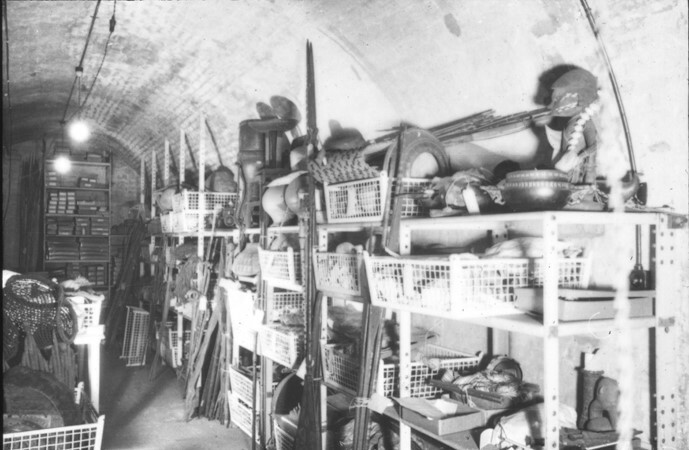 Plenderleith (1898-1997) was ICCROM’s first director general and had previously worked for the British Museum, where he helped address the issues of deterioration on the objects that were stored in the London Underground during the First World War. The glass slides that I re-housed illustrated these artefacts being stored in the London underground. Can you guess which underground station this is? I then assessed the archive’s photographic collection, and through Plenderleith’s connection to the British Museum I came across many links to the Institute of Archaeology and the former conservation students and its staff, including our professor Dean Sully! 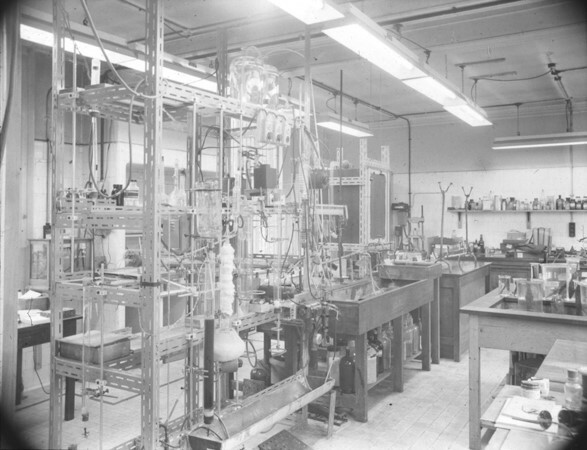 The British Museum’s Conservation Laboratory, by H.J. Plenderleith. Courtesy of ICCROM archives. Upon completing the condition survey, I noticed that many of the prints had been covered in pressure sensitive tape, some as old as the 1970’s and others applied more recently. The older tapes showed signs of deterioration despite the archive’s environmental conditions being kept at low temperatures (8oC-10oC) and 45-50% RH. 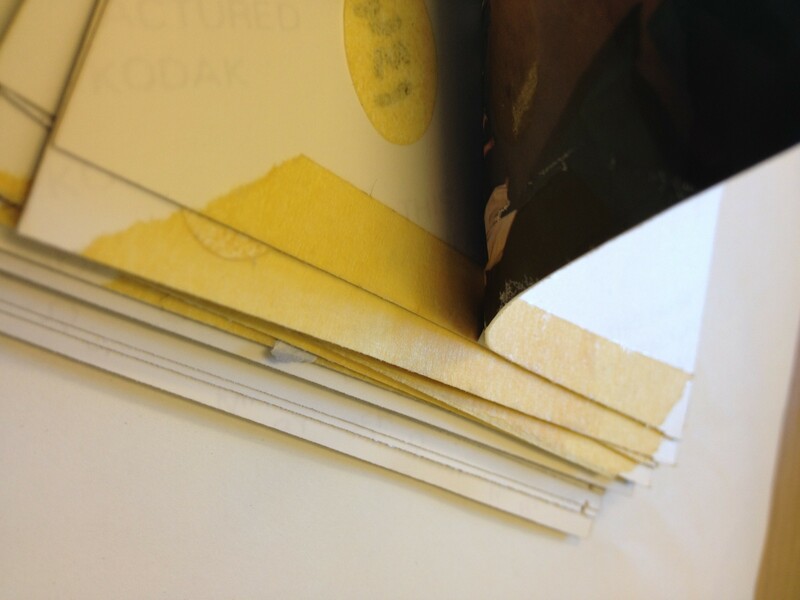 The tape carriers had become heavily discoloured and the adhesive had become tacky, sometimes staining the print itself. 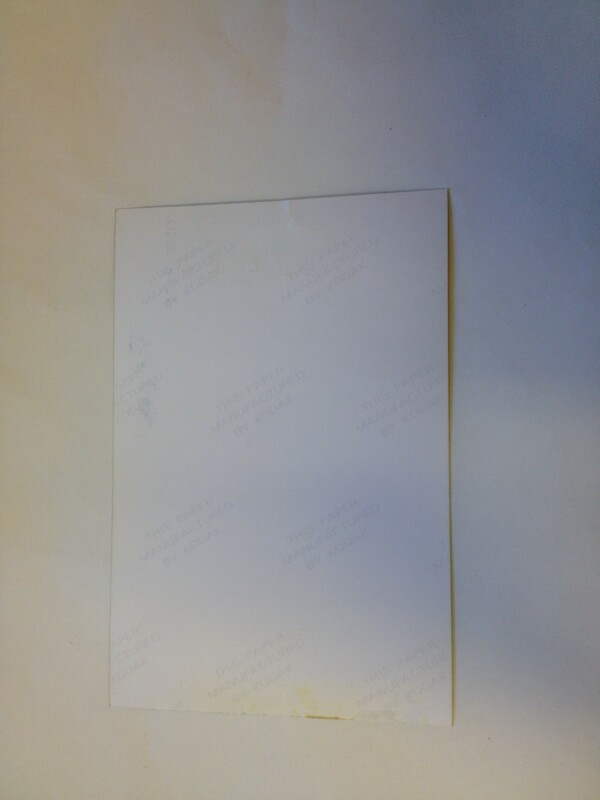 As the photographs were stacked together, the adhesive was transferring from the tape to the image side of the prints. I thought it would be a good opportunity to improve the state of the prints by removing the tape, both the already degraded ones and the newer tapes, to prevent future deterioration. Armed with only a scalpel, a pair of tweezers and a Mars Staedler eraser, I was able to remove the tape from the front and the back of the prints, as well as removing the tacky adhesive residue on the prints themselves. 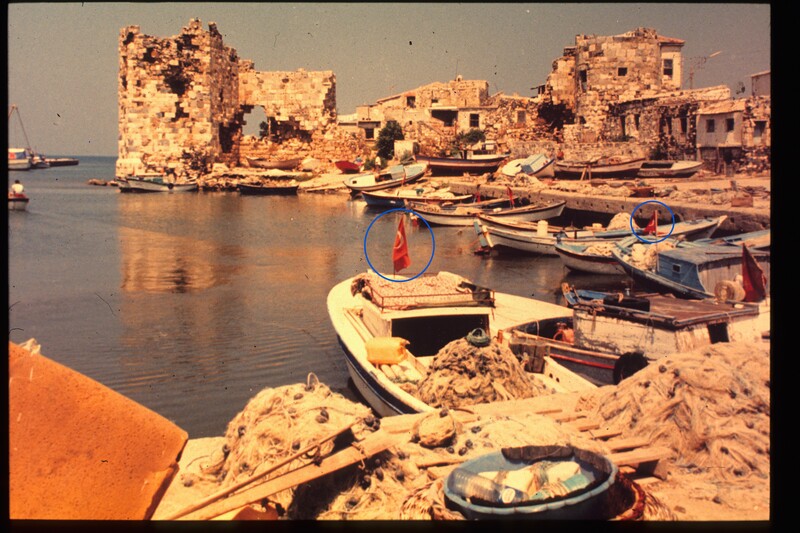 In the 55 years ICCROM has been operating, the world’s immovable and movable heritage has undergone many changes, much of which has been documented in the photographic records available at the archive. Some of these places have been lost forever, such as the recent attacks on the archaeological site of Palmyra, where images are the only thing we have left of these treasures. Fortunately, despite the many losses and irreversible changes that have taken place over the years, archives like the one at ICCROM continue to record these events. The archive at ICCROM is an incredibly rich source of information that is valuable not only to professionals in conservation and the cultural heritage sector, yet few people know about it and the information it contains. It was an incredible experience that taught me how to organize and document a very large volume of material and showed me the value behind doing so. But most importantly it gave me a chance to contribute to the prolonged preservation of a collection that, although underutilized, is an amazing resource for present and future generations. I encourage you to explore it!